Intel has announced a revolutionary new product in the UK e-reader market, the Intel Reader. Instead of pitching itself up against the like of the Amazon Kindle or the Sony Reader, Intel is bringing the notion of ebooks to another market entirely – those who suffer from visual impairment and dyslexia. The concept of the device was created by Ben Foss, Director of Access Technology at Intel and someone who has severe dyslexia, which puts him in the 'four per cent' category. 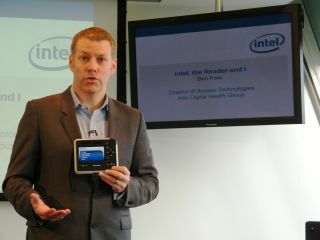 Speaking at the UK launch of the Intel Reader, Foss told TechRadar that the device was something that aides those who have trouble reading: "If you are someone who has a visual impairment or is dyslexic or in any way have difficulty in reading text this device can help them," he explained. The Intel Reader is about the size of a paperback and is simple to use. Essentially it can take a photograph of any printed material and read it to the user aloud. Each page 'fed' into the Intel Reader takes around 30 seconds to input and everything from school books to newspapers are compatible with the device. "We see this technology as being a 'ramp' for the book. We have ramps in buildings everywhere, so people using wheelchairs can gain access; this is for people who have difficulties with text get into that text," added Foss. Although the Intel Reader will be sold online through Amazon, Intel is really looking at the education market, a place where the device will be well-suited. "If I was given the choice of a high-end laptop and a device that helps me read when I was at school I would have chosen the latter," explained Foss about the importance of this type of technology in schools. "The social cost of not being able to read at 14 is very high. That independence is of values to the user." The Intel Reader comes with a 2GB memory, which allows for around 500,000 pages of raw text or 600 photographs. Photos can be taken from around 50cms away and will read a 10pt font from this distance. The whole thing is powered by Intel's Atom processor. Alongside the handheld device, Intel is also launching a Portable Capture Station, which comes in the form of a plastic suitcase. The Station allows for better capture of bigger books, consisting of an arm-mount and base plate for books. As for what the future lies for the device, Foss is confident that the eReader will be fully updatable and eventually come with a number of different voices – "you'll be able to get the Queen and Elvis!" – and there will be a number of different languages available. Foss is realistic about what the Intel Reader can do, however, admitting that there won't be things like handwriting recognition anytime soon. "The industry has found that there is something called 'Star Trek expectations' for new devices," he notes. "It's the notion that consumers expect some things to instantly be able to do things like 'put me into hyper drive', 'make me a coffee'. Technology is not that advanced yet. "The reality [for the Intel Reader] is that it can read print and articles, and tech like handwriting recognition is not quite there yet, there are still limits with this." The Intel Reader is available now to buy from Amazon, HumanWare and Inclusive Technology. Price for the Intel Reader is around £1,000, with the Portable Capture Station available for a further £250. Go to www.intel.com/healthcare for more information.